Wing of Calliphoridae fig. 175. 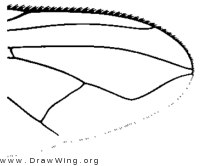 Wing tip of male of Opsodexia serva from Shewell (1981, fig. 20) . (1981) Calliphoridae. in: McAlpine J.F. (Ed. ), Manual of Nearctic Diptera. Agriculture Canada, Ottawa, pp. 1033-1045. 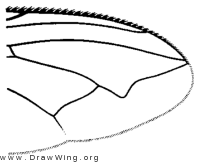 Wing tip of female of Stomorhina lunata from Shewell (1981, fig. 19) . Wing of female of Chloroprocta fuscanipennis from Shewell (1981, fig. 18) . Wing tip of female of Calliphora vomitoria from Shewell (1981, fig. 10) . Wing tip of female of Acrophaga genarum from Shewell (1981, fig. 9) . Wing tip of male of Bellardia agilis from Shewell (1981, fig. 8) .